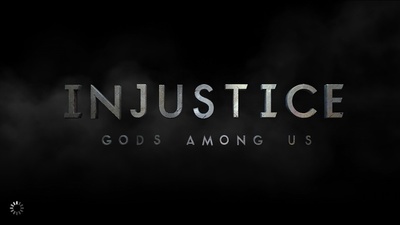 Injustice: Gods Among Us is one of the few available mobile games that provides console gaming quality in terms of graphics and gameplay. The game is highly addictive but the early stages can be a little boring and repetitive. Injustice really opens up once you’ve leveled your heroes a bit, so why not power level your heroes and bypass all the boring stuff. Here’s how! First off, let’s look at why you would bother power leveling in the first place. Doesn’t this just mean the game will be over that much faster? Yes, you will beat the story, called the ‘Play’ mode, much faster but that leaves the real meat of the game – the online battle mode and the special character challenges - for you to conquer. Leveling up your character means you’ll be more likely to get near the top of the weekly leaderboard in the Online Battle Mode, and it will make it easy for you to collect all the special characters like the Arkham Knights Deathstroke, Aquaman or Luchador Bane. There are three ways to power up your heroes besides grinding up their levels: Promotions, Daily Challenges and Character Challenges. Let's look at each one in depth. Leveling isn’t the only way to power-up your characters. Each hero has three special attacks, Support Enhancements and Gear slots. Special attacks are attacks that can be boosted using the credits you earn by winning battles. At low levels, you can only use the first of the three attacks. The second attack becomes available at level five and the third at level twenty. Each attack can be upgraded ten times with the first attack being the cheapest to upgrade at a thousand credits each upgrade. Maxing out this first special attack should be your first priority with any hero you wish to power level. Using this attack is going to be one of your primary ways of winning battles. There are also three Support Enhancements and three Gear slots. Gear slots become more of a priority for higher level characters but low level heroes can still pick up some nice gear bonuses. 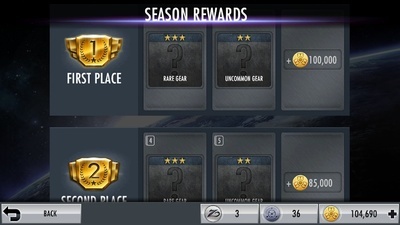 Gear is awarded through the Play mode, as prizes the online battle seasons or they can be purchased in Gear Booster Packs. Gear comes in three levels, common, uncommon and rare, which are designated by having one, two, or three stars. Each piece of gear will give your character an extra boost. Characters only have one gear slot available unless more are opened up for twenty thousand coins and forty thousand coins respectively. You will want to open up extra gear slots in time, but don’t worry about them before your character is around level 30. For now, just try and fill that first gear slot with something that will either boost the amount of damage you block, or boost the damage you do with either basic attacks or Special 1 which is your first special attack. You can change out your gear as often as you like, so experiment until you find what you like. The Support Enhancements are more handy than most low-level gear. Each hero or villain has three support cards, one will enhance that hero’s life by 10%, another that will enhance damage by 10% and another that enhanced energy regeneration. All three are important, but if your goal is to power-level a character, then the energy regeneration will come in very handy because without energy, you can’t play. Each enhancement costs credits ranging from three thousand to eight thousand, but once purchased, the enhancement works on all of that particular character. 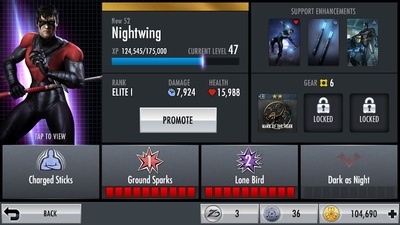 This means if you buy the enhancement on Nightwing, when you get new Nightwing characters like the New 52 Nightwing, they will already have that enhancement. 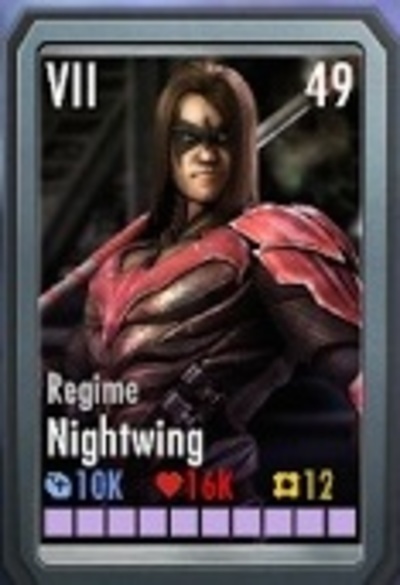 One of the best tactics to power leveling your character in Injustice is to promote them. This is done by buying additional copies of the same character, then merging them. Each character can be promoted up to seven time. If you look at your characters, the level will show on the right-hand side and the promotion level will show in roman numerals on the left. To promote a character, edit your team and tap the character you wish to promote. You will see a large PROMOTE button (yes, it’s all in caps). Tap the promote button to see how many credits are required. Luckily, bronze characters, which are the weak, starter characters, are cheap to promote. The cost ranges between eight and eleven thousand credits each, and is well worth doing. Some characters can only be promoted by acquiring their card through booster packs, making them harder to promote. Promoting a character boosts that character's attack, health and special attacks immensely. Online Battle can yield some major prizes and be a great way to power level your characters. Online battles provide great experience and provide battle points for that week's competition. The online battle is not live player versus player matches. Players still compete against the game’s computer, but the computer gets to use your opponent's characters along with all their enhancements, gear and promotions. The weekly competition prizes include gear and credits. The higher on the leaderboard you are at the end of the competition, the better the prizes become. Besides the weekly competitions, there are also daily challenges called Bonus Missions, which can provide a much needed boost to your credit account, and some bonus points that go towards the weekly competition. Logging in daily, even if its just to beat the three daily challenges, will help power level your characters fast. Injustice introduces a new character at a rate of about one per month. Once introduced, players must defeat a set of challenges to gain a copy of that hero or villain. And these heroes and villains are not the weakling bronze character you start off with, but high level Gold characters. There are five sets of challenges, each with their own prizes. To complete a challenge, players must reign victorious after playing through a number of battles, either twelve or fifteen depending on the challenge. To play a battle, you must use a challenge token. When a challenge is introduced, you will be provided with twenty-five tokens but more can be collected by winning battles in the ‘Play’ mode. 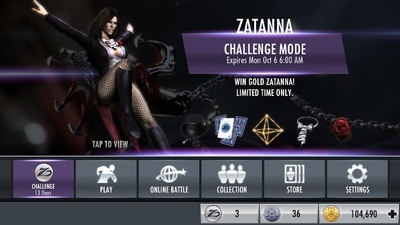 These challenges are a great way to pick up free Gold characters. The only other way to get these characters is to buy Challenge Booster Packs at 150000 credits a pop. Once you have completed all of the challenges, the entire challenge starts over again but gets much harder. In theory, you could win a Gold character, and then max out its promotions by winning the challenge seven times. Even if you don’t win the Gold character, the easier challenges are always worth completing because of the free prizes, which usually come on the form of booster packs or credits. 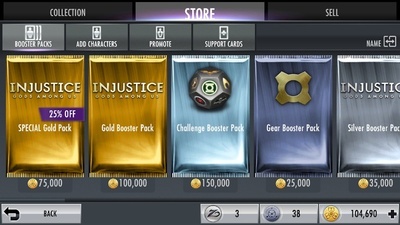 Following these steps will make Injustice an easy favourite on our Apple or Android device.